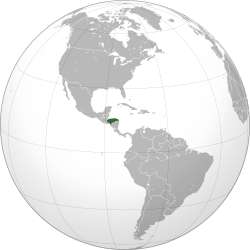 ↑ ੨.੦ ੨.੧ ੨.੨ ੨.੩ "Honduras". International Monetary Fund. http://www.imf.org/external/pubs/ft/weo/2012/01/weodata/weorept.aspx?pr.x=69&pr.y=4&sy=2009&ey=2012&scsm=1&ssd=1&sort=country&ds=.&br=1&c=268&s=NGDPD%2CNGDPDPC%2CPPPGDP%2CPPPPC%2CLP&grp=0&a=. Retrieved on 18 April 2012. ↑ 1992–2007, "Human Development Report 2009 – M Economy and inequality – Gini index". Human Development Report Office, United Nations Development Programme. http://www.webcitation.org/5kbHWMLQA. Retrieved on 17 October 2009. ↑ "Human Development Report 2010". United Nations. 2010. http://hdr.undp.org/en/media/HDR_2010_EN_Table1.pdf. Retrieved on 5 November 2010. ↑ "Archeological Investigations in the Bay Islands, Spanish Honduras". Aboututila.com. http://www.aboututila.com/UtilaInfo/William-Strong/AI-Environmental.htm. Retrieved on 27 June 2010.